At the 2018 ALA Midwinter Meeting in Denver, CO last month members from across the nation gathered to discuss, engage and inform of the hottest trends and topics of the association today. 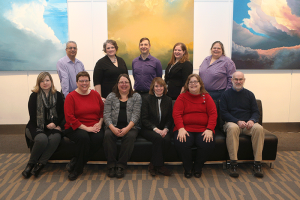 (Bottom) Stephanie J. Graves, Jenny L. Presnell, Alesia M. McManus, Chris LeBeau, Ann K. G. Brown, Greg Fleming. Not pictured: Candice Townsend, Sarah Jane Hammill, Mary M. Mintz, Cindy I. Levine, Micquel Little, Chellammal Vaidyanathan, Patrick J. Wall. Welcome Ninah Moore to RUSA!